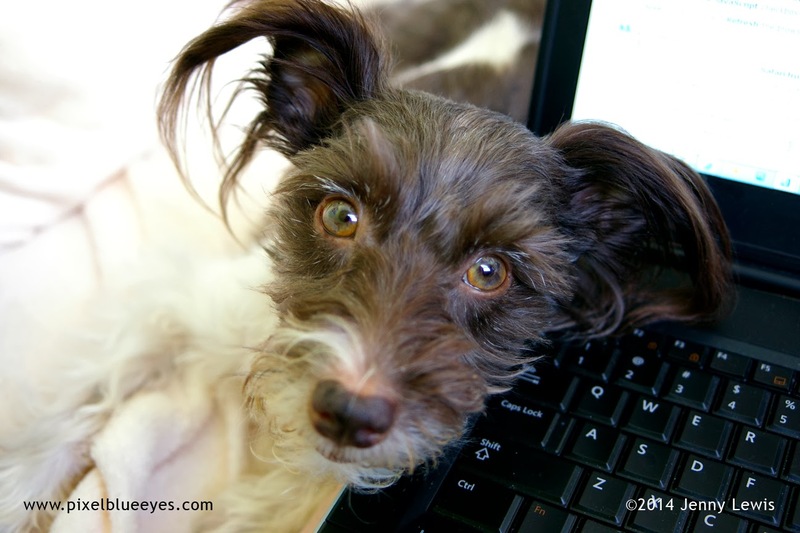 I love it when Mommy gets to work from home, like she did on this Wordless Wednesday. It snowed a lot the day before and overnight, so getting out of the driveway was out of the question. Good news for getting to spend the day watching her work. Of course I made her take breaks as needed. Mommy especially loves how this serious photo of me shows just how colorful my eyes really are. Thank you natural lighting for highlighting my "Pixel Blue Eyes" so very well! 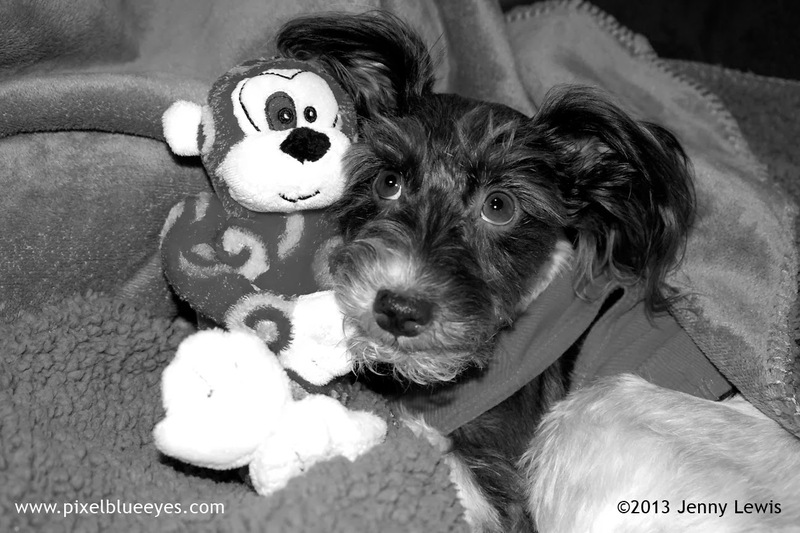 Happy late night Wordless Wednesday friends! 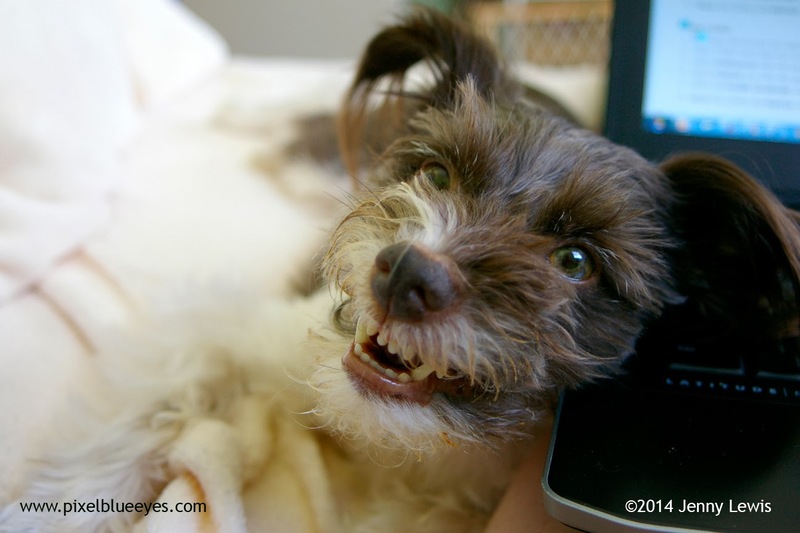 This blog hop is hosted by my friends at BlogPaws. 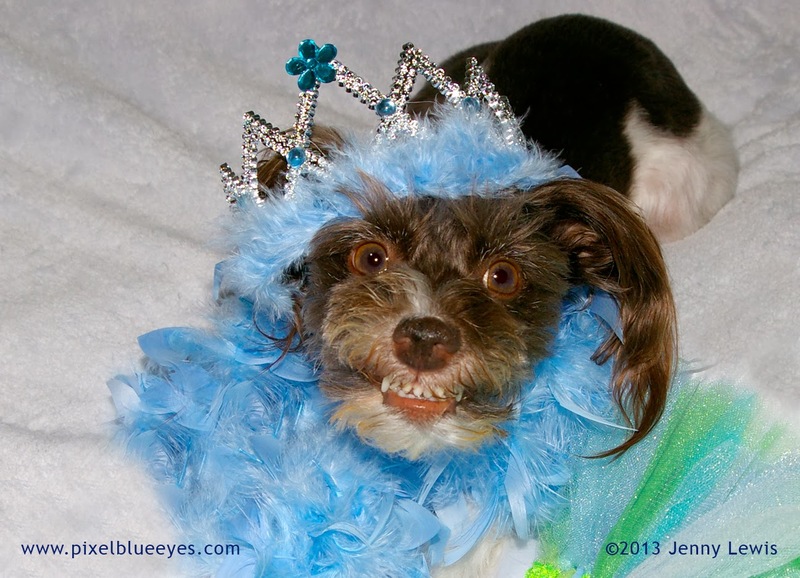 Visit some of the other pet blogs below and see what fun photos they shared. 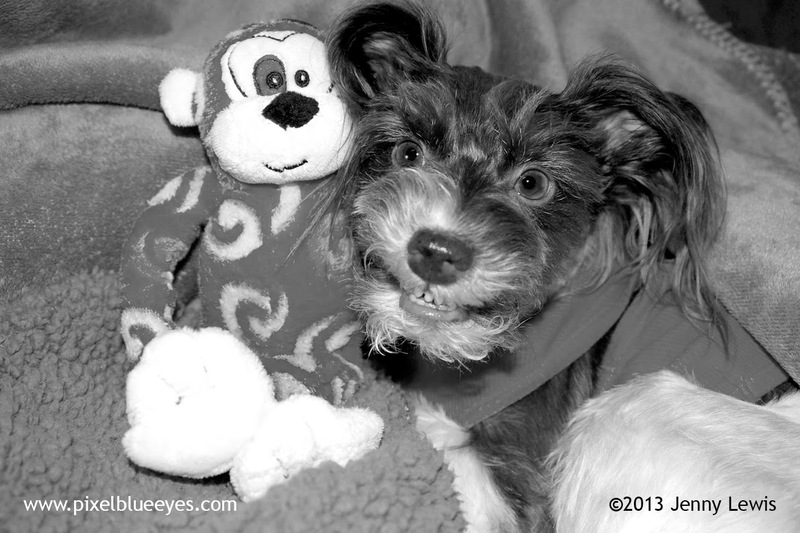 For Black & White Sunday, I thought I'd revisit a special set of photos with my dear friend Randolf the Red-Eyed Monkey from this past November. We really enjoy each other's company. He really makes me laugh! And he always makes me smile! 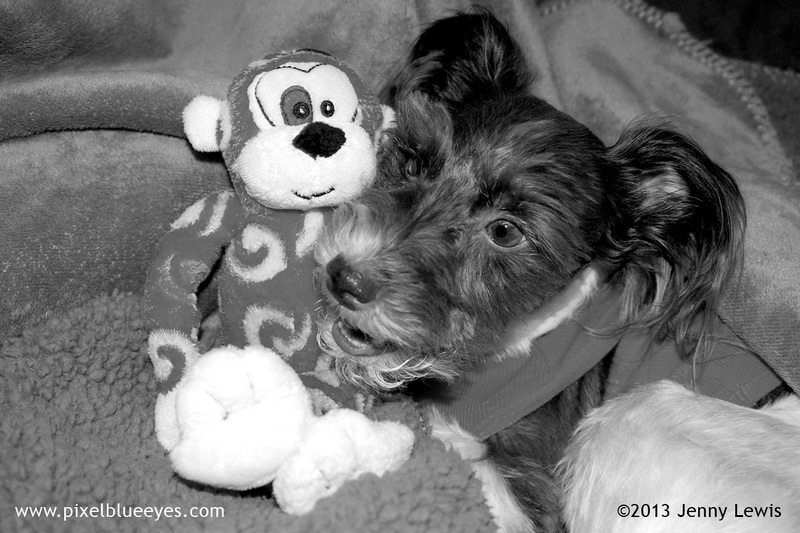 A Twist of Fate on Pixel's "Wordless Wednesday"
Wordless Wednesday. It's supposed to be a happy pet blogging day where we take a break from the multitude of "words" that are our trade and post images of meaning, joy or substance. Yet today of all days, my words fail me. 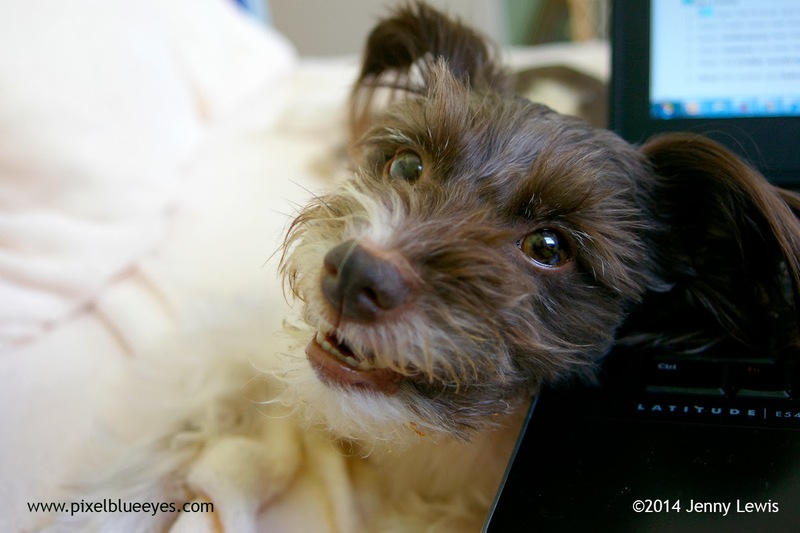 As I sit barren of words in front of this tormentor that is my laptop, I feel as though Wordless Wednesday is teasing me. Oh what I would give for a melodious set of words to come to me now. What would Shakespeare have done if such a thing as "Wordless Wednesday" had occurred in his day? Would he, too, have been haunted by the mere mention as he sought to find the words to his next great masterpiece? Did he have times where it felt like the creativity of his mind was locked away, as if his quill was an old chicken wing with which he could not pick that lock? 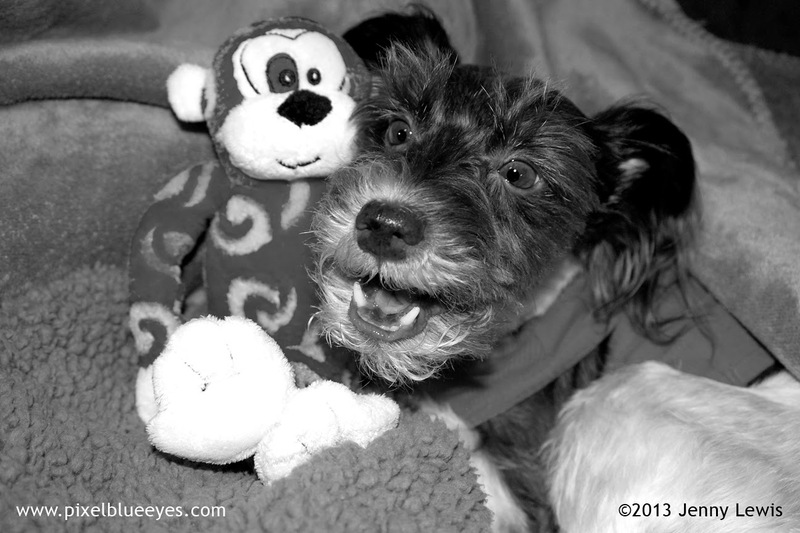 Oh Wordless Wednesday, what hast thou done to me? Oh to find the words...to unlock the prison that is my mind and let the well of inspiration spring forth in a torrent of brilliant words. Let the waves of creativity crash down on "Wordless Wednesday" like it was high tide and a full moon. What Mommy? It's past my lunch time and I just need to eat? Well why didn't you say so before? Next time, remind me to bring a snack or something before I sit down to write, for goodness sake! 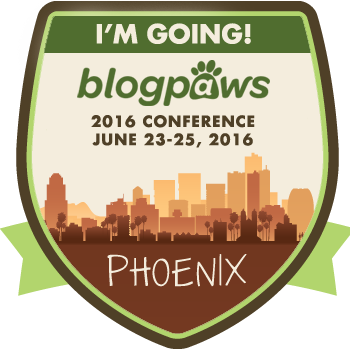 This is a blog hop sponsored by my good friends at BlogPaws. Let's go see what other creative Wordless Wednesday posts my friends have. It's very cold and snowy today, so I could not really go outside and play. But my little friend Blue Bunny decided she'd get me to play inside with her while the winter sun shone through the window of our room. We had a wonderful time together! She had such a perfect way of getting me to play. Can you guess what she might have whispered to me to elicit such excitement in my face? Pixel's Pet Blogger Challenge 2014 - My Plans to "Pixelize" the Pet Blogging World! 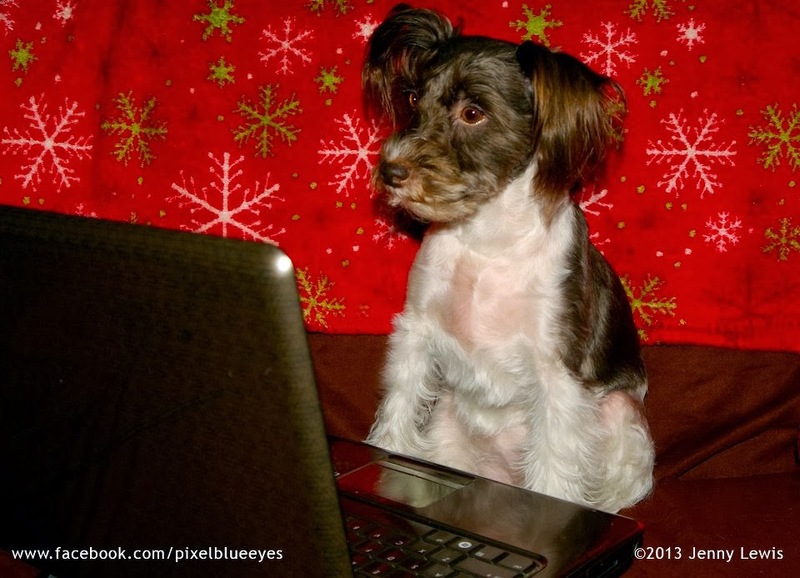 Pixel's Plans to Pixelize the Pet Blogging World in 2014! 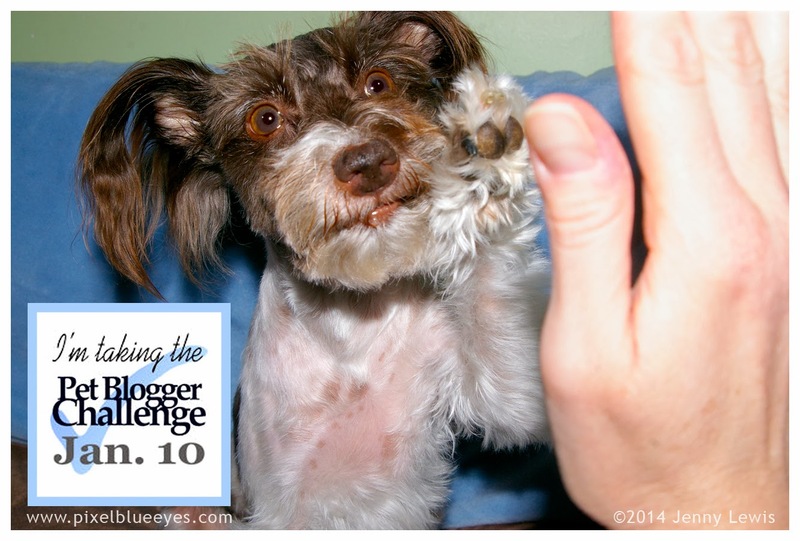 For the first time in my pet blogging life, I am taking part in the Pet Blogger Challenge, which takes place every January 10th. It’s a time for pet bloggers to see how far we've come and make some plans for where we’re going (with our blogs) in the new year. I started my blog when I was but a little puppy, however I didn't really take it very seriously until about 2 years ago. we love animals, we love blogging, and we want to be the very best that we can be at our craft. I've been working very hard over the last few months especially, to bring my blog to a whole new level of fantastic, so I am very excited to join in this challenge. There's a series of questions I must answer to help share my ideas, goals and hopes for the future of my blog. Here goes friends! 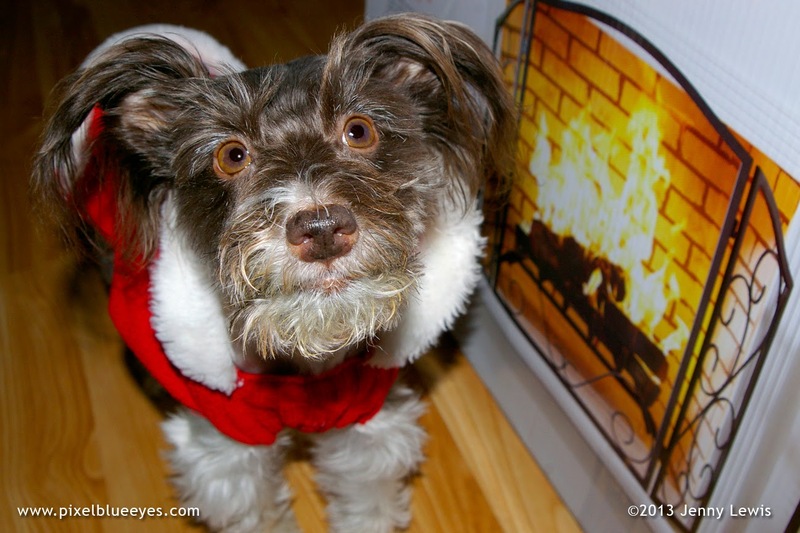 The Joy of a Warm Cozy Fireplace, a Pixel Favorite! 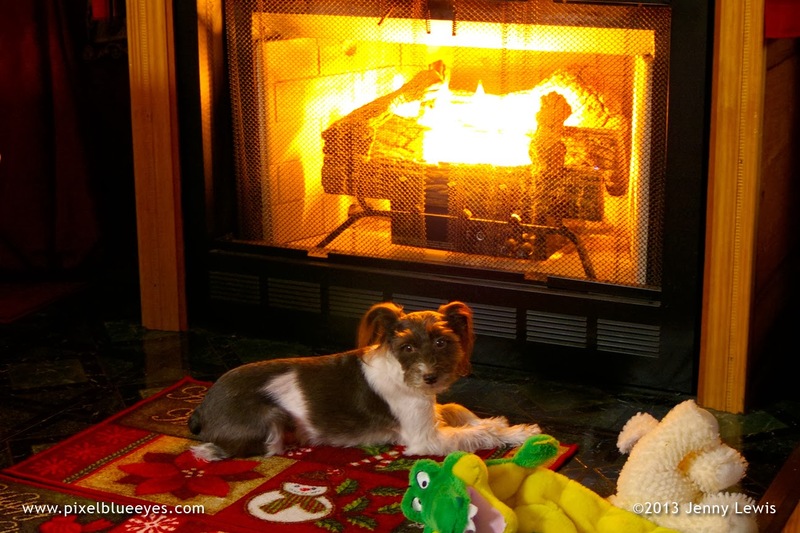 I am not sure when I first discovered just how wonderful a cozy fire is in the fireplace, but I absolutely love it! We have a gas fireplace that has a thermostat, so it only comes on when the temperature gets to a certain point in the living room. If I was tall enough, I'd set that thermostat to 90, then it would keep the fire going indefinitely. But, since I can't do that, I just relish the moments it comes on. I sometimes walk over and sit real close to the fireplace, willing it to come on. Then somehow, it magically does! I swear, I think Mommy or Grammy must be watching and that they increase the temperature on the remote just for me, but I'm sure I must be imagining it. Whatever the case I LOVE it. Everyone has been getting all worried about me getting too close to the fireplace, even though I am a master Pixel fire dog. I stick my face sooooooo close to the fire, which has a metal curtain that can get hot. I've never gotten burned, but I know I make Mommy nervous, so for Christmas, Grammy bought, just for me, a fireplace protector screen. It's not to protect the fire she said, but to protect me! Isn't that just the sweetest thing ever? And so thoughtful. Now I can sit as close to the screen as possible and no one has to worry I might get burned, and no one has to try and get me to move back from it. Thank you Grammy!! Did you get a thoughtful gift from someone this past holiday? I'd love to hear about it! 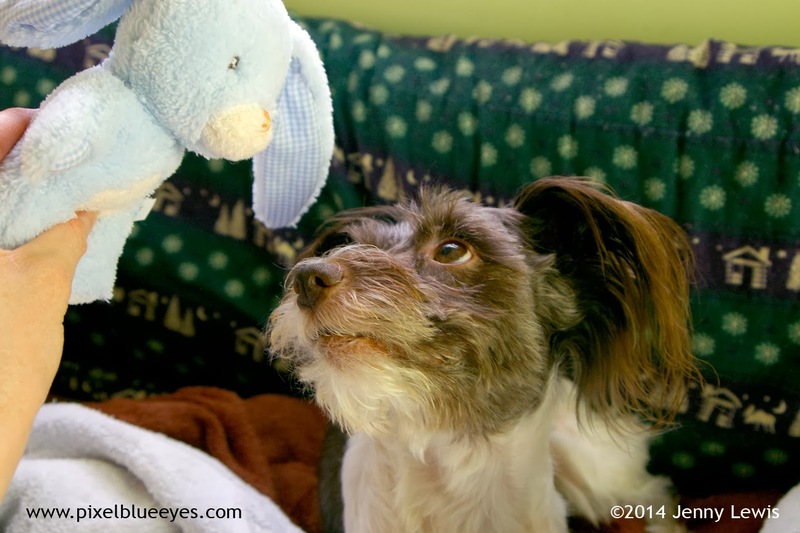 This post is part of the BlogPaws Wordless Wednesday blog hop. But who can be wordless when you get a gift like that? 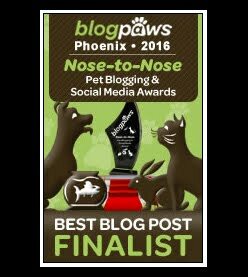 Lots of my fellow pet bloggers have taken part in this blog hop, sharing their own photos and stories. Go check them out by visiting some of the links below! It's always such a gift to make new friends that share your enthusiasm for things you are passionate about. 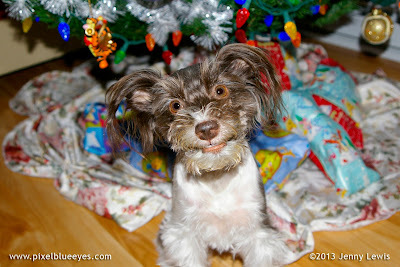 I was given a wonderful opportunity to take part in a "Pet Bloggers Gift Exchange" this holiday season. It's a bit like "Secret Santa" except you know who has your name and you do something special to help celebrate their work. I was given the wonderful honor of celebrating Te-Ling Chen , the creator of "Dogs Give Us Their All" blog. Te-Ling certainly has the right idea about us dogs. We really DO give humans our all. Her wonderful blog highlights all kinds of stories of dogs being selfless, heroic dogs who save their families, and dogs who are rescued from all types of horrid situations yet still have a heart full of love and forgiveness. 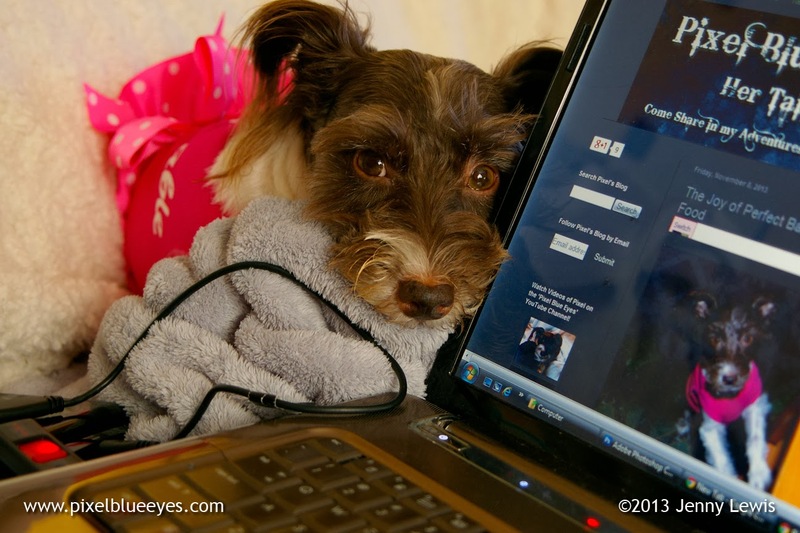 She even shares the occasional celebrity dog photos on her blog. "Dogs Give Us Their All" is a fantastic collection of photos, stories and her own personal experiences. Her blog is kind of like having several different types of your favorite candies (or dog treats) in one big bag. Every time you pull a piece out, it might be different than the last, but it's just as wonderful as the previous piece. 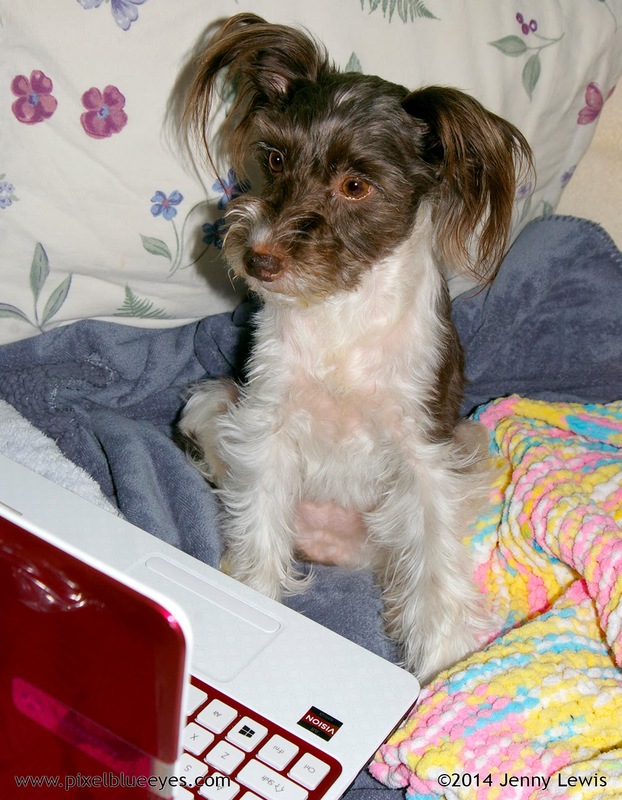 Te-Ling doesn't just blog about dogs, she trains them too! 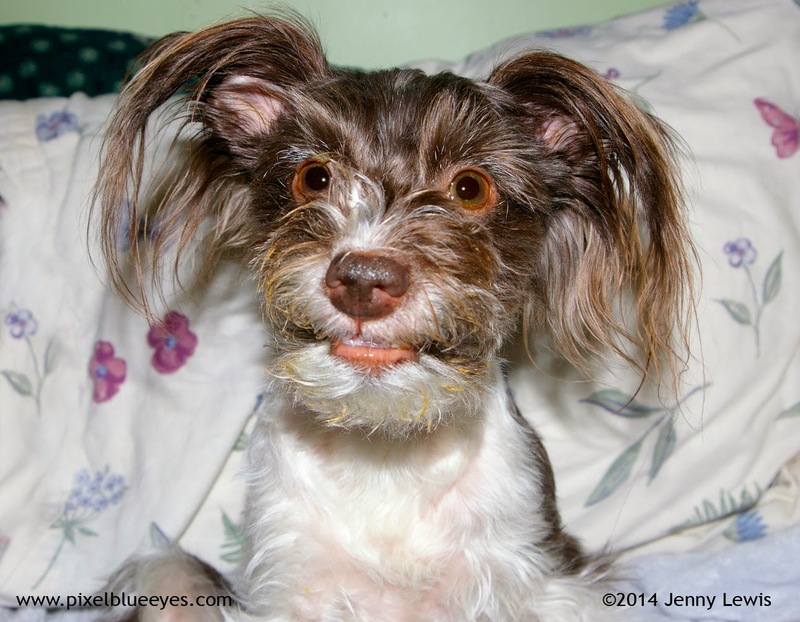 She has some great posts about teaching your dog to do tricks and listen to commands. 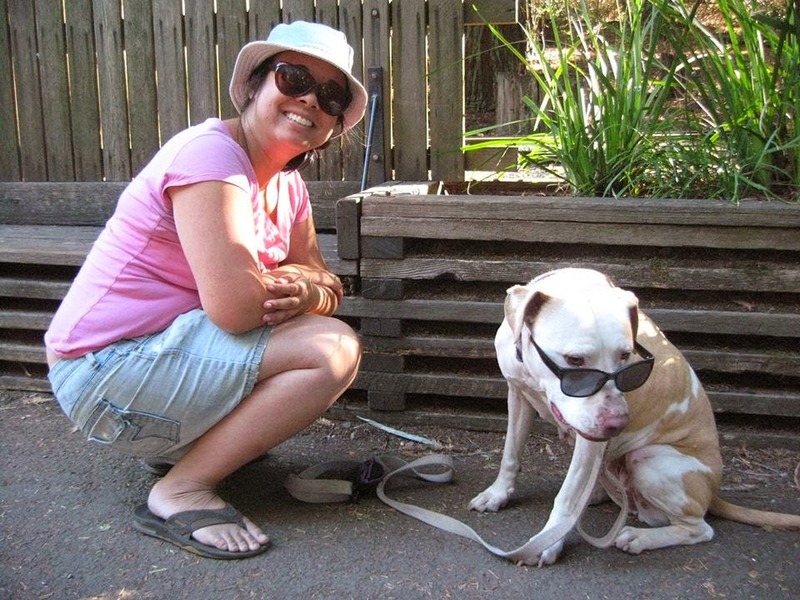 She trained her own beloved pit bull, Lady, whom she adopted in 2010. Lady has taught Te-Ling so much about the struggles that pit bulls encounter. She says Lady is one of the most loving, patient, mellow dogs she's ever met. Te-Ling is an incredibly friendly person who has a captivating brilliant smile that lights up her whole friendly face. She obviously gives dogs her all, just as they give their all to her! I'd love to have you go visit her "Dogs Give Us Their All" blog and Facebook page today. We all could use more friends, so why don't you stop by and introduce yourself. And tell Te-Ling and Lady that Pixel Blue Eyes sent you! The Joy of Dreaming BIG in 2014 - Happy New Year! What an exciting week it has been! A brand new year has come to town, and I am welcoming it with open arms and paws. In fact, I dressed up in my best princess outfit to give it a proper welcome. I see great things in store for 2014 for me, my blog and the Pixel Blue Eyes conglomeration. I bet you didn't realize I had a conglomeration, did you? Well neither did I until I looked it up, BOL! Seriously, I am so grateful for this new year that brings new opportunities to realize my dreams. It feels like a new chance to do great things, help more people, share more smiles, be even more thankful for all the good in my life, and of course love even more. I told Mommy a couple of months ago that I wanted to redesign my blog to make it a bit more professional looking. 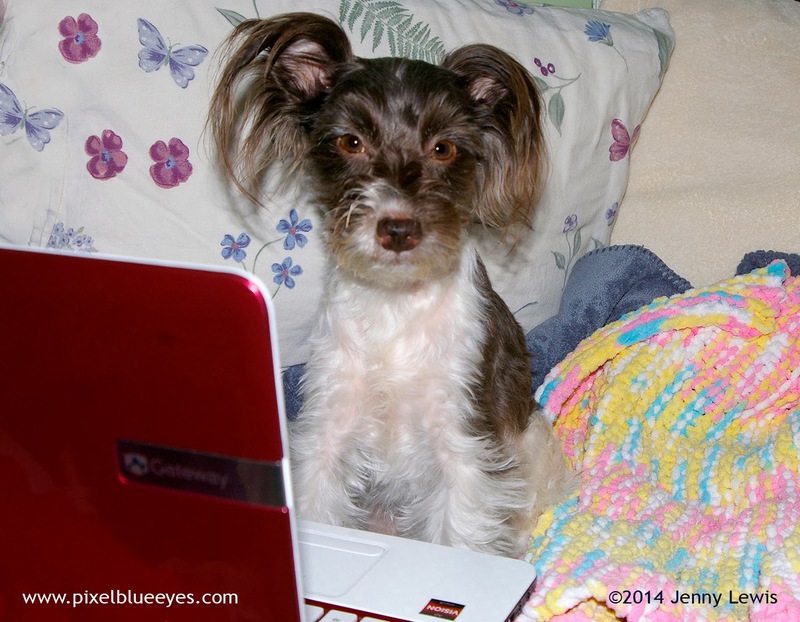 I am, after all, a professional blogging doggie. So, she and I have been busy planning and designing, updating and changing things. I oversee it all, and I am very happy with the new look so far. We have the template complete, the new colors updated, the right side banner looking clean and sharp, and my first 'tabbed' section. I wanted all of this part done by the new year, and by golly, we reached that goal! 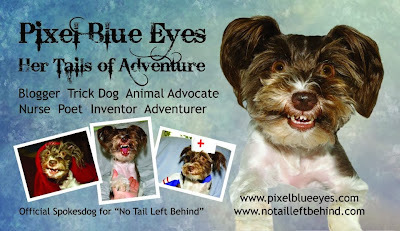 I felt we should complete the "Meet Pixel Blue Eyes" portion of my newly revamped blog first. I wanted to share a little more about me that a lot of people might not know. I hope you like it. You'll have to read it and tell me what you think. We also updated the banner to make it a bit more fun, like my business cards are. See? Eventually ALL things Pixel, including Facebook, Twitter, and my other social media accounts, will match so there will be instant recognition no matter where people go to find me. It's all part of my BIG DREAM to share my joy, fun and adventures with even more people. 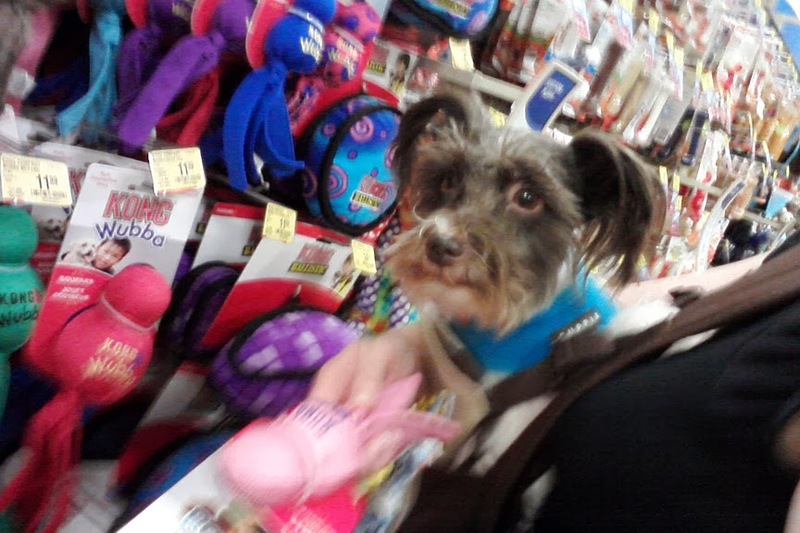 I also want to attend BlogPaws 2014, which brings me to my next dream: I want to get hired by more companies. You clearly can't go to Vegas without sponsors, and the funding needed. It's just a reality of business. You'd hire me, right? I could sell ice cubes to ice cube vendors if you wanted! Another big dream of mine is to have my favorite toy companies hire me to be their official tester and/or shopper of all the toys they make...ones that are my size of course. I'd sub hire a couple of my big dog friends to test the larger toys. Then I could travel the world, sharing the wonderful joys of the toys as part of my job description!! This is the year of dreaming BIG for this little girl. And of course, I really want to work with the wonderful companies I've already worked with (you know who you are) a LOT more...hint hint. There's no limit to the possibilities. So, what are your big dreams for 2014? Why not just let it out, you've got to tell someone...why not me? Leave me a comment on your big dream of 2014 if you dare. No dream is too big. Trust me on that one!